I just thought I do a quick post updating you all on some more recent press bits and bobs, in case you're interested! 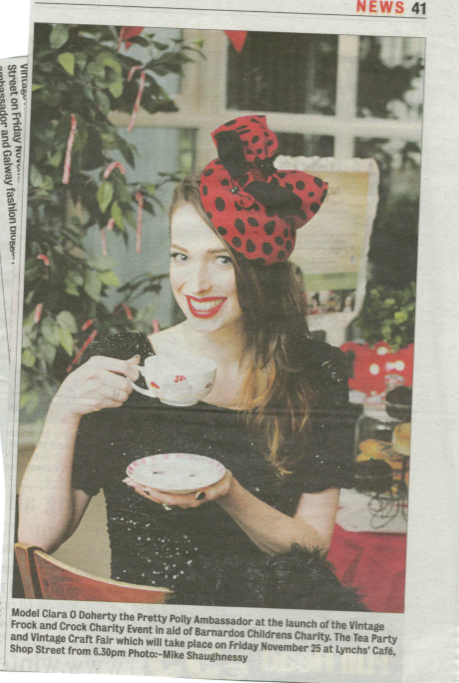 Here are two press shots that were featured in the Advertiser and the City Tribune recently, from the opening of The Frock and Crock Sale, a charity event that was held in Lynches Cafe. 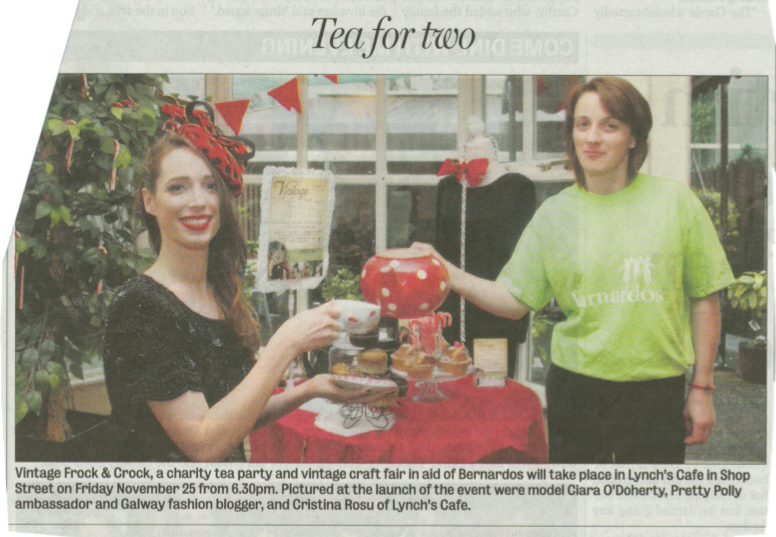 I was more than happy to be involved with the press shots, especially since friend and fellow blogger Sinead Lally was organising it, and its always nice to help a friend out. Unfortunately work commitments left me unable to attend the actual event (boo!) but I was able to catch up on all the goings on via Sinead's blog here, g'wan have a click! I was also featured in the Irish Daily Star yesterday in relation to my involvement with the Movember Ireland, a fantastic cause that I am very proud to be part of! We had our Mega Mo Party on Monday night in the Roisin Dubh and it was a huge success, there were free drinks and raffle games, I even won a prize! This week I was also featured in the Advertiser for their "Proust Questionnaire" feature. The questionnaire one of my favourite pieces of the paper and so I was delighted to be asked to participate. Here is the interview if you're interested, since its nigh impossible to read from the photo! Climbing Trees! Or a nice bun. Genghis Khan... Now there's someone I'd love to have a pint with! I have to cheat and say 3: my sisters. They're a force to be reckoned with, and I've learned prettymuch everything I know from them. Which is the trait you most deplore in yourself? Clothes. I'd happily be broke and fabulous. My favourite journeys are always going to new places, for new adventures! Rarely, and very poorly at that. Im a terrible liar, you can read it all over my face. I don't despise anyone, and am happy the fact. I save my energy for better things! My french boyfriend Estoban. We met on holidays when I was 7. He had a blonde bowl-cut and dungarees. He had no English, nor I French, but he shared his bonbons with me. How I still pine for him! Walking in Coole Park with my family and our four dogs. I wish I could grow a mustache so I could participate in Movember Galway this year. I think a nice pair of handlebars would look most fetching on me. Love, Freedom, Chaos, Experience, Excess, Now... in that order. I guess I'd have to say staying true to myself thus far, and trying to have positive attitude no matter what. Those traits have led me to some wonderful places, and continue to do so. Im very lucky. My sticker collection, that I've been adding to since I was 8. Im too old to trade them now, but I still collect them. Ive got furrys, shinys, holograms, the lot! I even buy rare ones of the internet. Its quite sad actually. To be in a trapped. Physically, mentally or emotionally. Anything involved in the media, broadcasting or presenting, preferably. Jack London is the author of my favourite book, The Call of the Wild. "Nar Laga Dia Do Lámh"
And thats enough of this press lark for now folks! You can see all of my other recent bits and bobs on the "IN THE PRESS" tab on my the top left of the site if you like! hah you're in press at least 3 times a week ! I'm so proud of you baby..
Hi, thanks so much for following my blog it means a lot! I love your blog already, it's so happy, lovely to read.